YG Family recently hooked up a commercial with Nikon Korea to promote their cameras. Last week, I posted CL (이채린) wearing an outerwear from Suno, guess which designer did Sandara Park (박산다라) wore? Seems like 2NE1 stylists love Versace Resort garments. 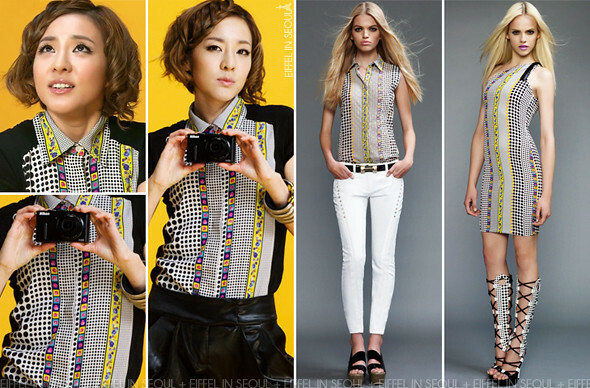 Sandara Park (박산다라) wore a modified shirt from Versace Resort 2011 collection. Her outfit was styled with latex pants as well as Giuseppe Zanotti Swarovski-Embellished Sandals. Check out which other Versace Resort item 2NE1 was seen wearing before. pls tell me i'm not alone? I actually think she doesn't look bad. Nina Garcia - Fashion is expensive. Style is not. Some of the most stylish girls I know are certainly not the wealthiest.